Seized by a Greenie wielding dishes as combat gear. 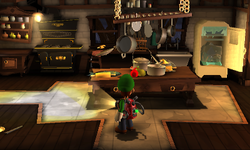 The Kitchen is a room in the Gloomy Manor in Luigi's Mansion: Dark Moon. This area is accessed by either using the dumbwaiter in the Dining Room or by going through the north door in the Patio. Inside the kitchen is a table with fruits, pots, and pans on it. A rack with pots and pans hanging from it is above this table. There is also a stove, a freezer, several cabinets, and a sink. By the dumbwaiter, there are some shelves and sacks of flour on the ground. The door to the left of the Kitchen leads to the Library while the door on the south leads to the Patio. The dumbwaiter takes Luigi back to the Dining Room. During A-3: Quiet Please, Luigi needs to access the Kitchen via the dumbwaiter in the Dining Room. The door leading from the Kitchen to Library is the only door that takes the player to the mini-boss battle against the Poltergeists. In A-5: Sticky Situation, the Kitchen may be one of the rooms that is covered in spider webs. Starting on A-3 and all missions after, Luigi can open the freezer to find an amethyst inside a block of ice. The block of ice can be carried, and carrying it to the stove melts the ice, revealing the gemstone. This page was last edited on May 1, 2017, at 21:06.